Thank you to adidas for sponsoring today's post. As always, all opinion are solely my own! 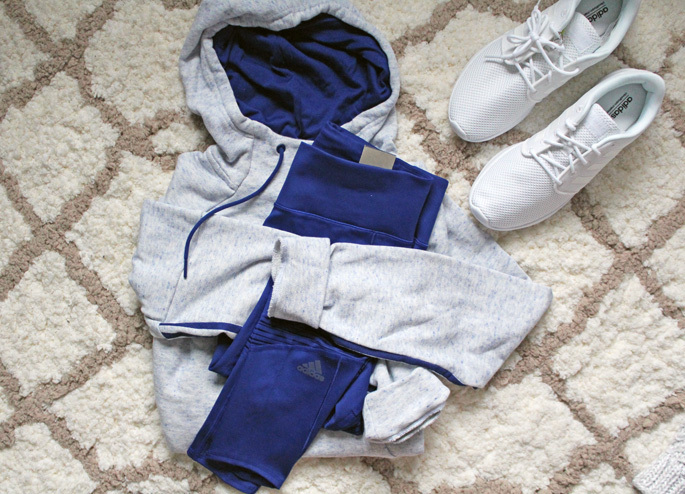 Keep scrolling for my favorite adidas gift ideas, but I had to share this cute gray and blue look is all from adidas and part of a gift I'm giving my sister this season. When I buy gifts for my sister whether it's for her birthday, Christmas or just-because I always think workout gear because as a former gymnast, she is what I call a fitness junkie and I wish I was more like her, hah! She's constantly working out and I always think of her when I see the cute new arrivals that I come across, especially from adidas. These sneakers are like walking on clouds - so comfy that I ordered myself a pair too! I loved the way they matched this pullover hoodie and these cobalt blue workout leggings. The best part is you could easily pair this pullover with jeans for a comfy/casual day of errand running too! Everything works for multiple occasions - something I always look for especially with athleisure wear. I also fell in love with this cozy and soft beanie that adidas has - it's THE softest material and such a beautiful shade of gray! Warm enough to wear all winter, cute enough to wear with any outfit, and the perfect price to make an awesome gift! 2. Apple Watch: a perfect gift for anyone on your list, but especially the girls who love to workout! 3. White Racer Sneakers: if you like walking on clouds, these are THE sneakers for you! They're great for workouts and wearing daily as well. These are the sneakers shown above that I bought as part of a gift I got my sister! 4. Ultraboost Sneakers: these are my most worn sneakers and I recommend them to everyone! I wear them more daily than for working out because they're just so cute. I love this blush pink shade - it's everyone's favorite neutral! They've also been my most worn running shoe and they hold up so well no matter how much you wear them. And if you work on your feet, don't even hesitate in buying these! There's so many colors to choose from and they'll be your favorite purchase in a long time. I'd recommend sizing a half size up! 5. AirPods: a must have for anyone who works out/runs/trains! No cords to worry about getting tangled in and the battery life is awesome. They're a bit less expensive now that they've been out for a while, and these are something you'll want also - something fun to add to your wishlist! 6. Sleeveless Logo Tee: these cute and simple tees are a staple for workouts! They're almost always on sale and come in so many colors - they fit loosely and are great for workouts. 7. Blush Pink Baseball Cap: another cute workout accessory that you'll get so much use out of and that all of the fitness lovers on your list will love to receive! 8. Climacool Socks: these are the best socks I've worn for workouts - they're the perfect weight and are meant to keep your feet from sweating as much. They're a great stocking stuffer! 9. Workout Leggings: the adidas workout tights/leggings are some of my favorites for workouts! These match the sports bra (#1) so if you're looking to gift a full fitness set to someone this is a great option. They're super similar to the cobalt blue tights I featured above and anyone will love to receive them. 10. S'well Stainless Steel Water Bottle: I gift these all of the time because of how well they work at keeping your drink cold and because the designs are just the cutest! This is my personal favorite and it's another great stocking stuffer, or something to add in to a workout gift you're giving. 11. Blush Pink Zip-Up Hoodie: if we're being honest, I wear my Stadium Hoodie way more than I'd really like to admit, lol! It's SO comfy and the perfect piece that you'll wear for everything, all the time. It comes in so many colors to pick from! 12. Black & White Superstar Sneakers: these have become super popular lately and for good reason - they're the cutest sneakers out there that have a less athletic look to them, but are still as comfortable as your typical workout sneaker! They run big so I'd recommend sizing down one full size (as do most reviews you'll find) and they match everything you'll wear, plus be a great gift! 13. Gray Zip-Up Hoodie: another comfy, multi-purpose hoodie that makes for a great gift (for you and for your girlfriends!). This one is a bit warmer and not as structured as the Stadium Hoodie (#11) is and is always a go-to of mine for traveling in. With Black Friday coming up (next week - HOW?!) adidas has all of their awesome deals listed and they are SO good! Get ready to shop and check out if something you've been eyeing will be on sale HERE. I love adidas! 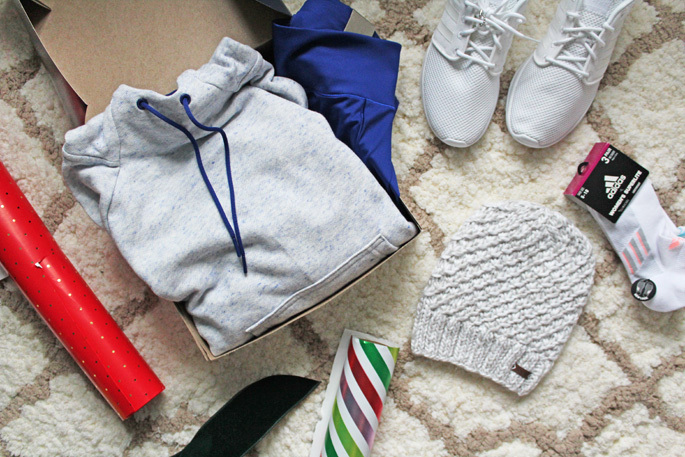 So many great gift ideas, I am in love with those leggings! Shopping for workout gear is one of my least favorite things. But you made me want to shop for all.the.things. Such great choices. I love the color combo! I'm loving those fresh new kicks! Nothing is better than a new pair of sneakers. Love this round up! Yikes, I can't believe that Black Friday is so soon! Thanks for these suggestions! Yesssss I love adidas!! That sports bra is super cute. Omg, I want ALL of these!! Definitely found a few items I want to add to my list! I'm not super into fitness but these are all great gift ideas! I'd love some of these things! These are great! Have to say, I want those white addidas for myself, haha!! Can't go wrong with fitness clothing! I wear my superstar Adidas all the time! This is such a great gift guide. That pink hat is adorable! The blush pink baseball hat is my favorite! Awesome picks. So many good picks! I just started working out more and need to add these to my Christmas list! These are perfect ideas for a fitness junkie! I love that cute beanie. Adidas is such a reliable brand. I've really been trying to workout more, but I'm the least motivated. I think having some cute workout clothes (like those leggings, yes, please!) would definitely motivate me to workout more. SO many great gift picks! Um, totally need those blush sneaks for myself! I want everything in your gift guide!! So many cute workout clothes and gear! I love all of these! Who doesn't need good gym clothes?! I also love that you included the Black Friday deals! Since I'm the fitness lover in the family maybe you can send this list to my family! I love all your workout outfits. I actually have the superstar sneakers and LOVE them!!!! Definitely a great list! Oh these are fantastic gift ideas for a fitness lover! I love that pink and green vibe you have going on! That sweatshirt looks super cozy! I am not into fitness so much but I have to buy some things from this list for my Tae Kwon Do class. I love the leggings and the shoes! I'm a workout legging addict! Definitely have some big fitness lovers in my life that could use these products!